Download our free income statement example (also known as a profit and loss or P&L) and edit it in Microsoft Excel. The profit and loss is one of the key documents within your company's financial statement. The dictionary definition of an income statement, also known as the profit and loss statement, P&L, statement of income, and statement of operations, is "an accounting of income and expenses that indicates a firm's net profit or loss over a certain period of time, usually one year." Simply put, your income statement tells anyone at-a-glance if your business is profitable or not. Typically, an income statement is a list of your revenue and expenses, with your company’s net profit listed at the end—often referred to as your "bottom line." 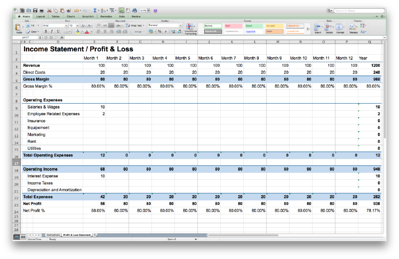 By downloading our Profit and Loss Template, you'll receive an income statement sample with built-in formulas, which you can edit directly to make your own. To learn more about what a profit and loss statement is and how to read it, check out our article on the LivePlan blog: How to Read and Understand Your Profit and Loss. Depending on your business and industry, your income statement may include additional sub-items within your operating expenses, like salaries and wages, insurance, marketing costs, equipment, rent, and utilities. Your profit and loss statement is usually reported at the same time as your balance sheet and cash flow statement. Together, those documents make up the key elements of your company's financial plan. Want us to create your income statement (profit and loss) for you? If you need more help creating your income statement, take a look at LivePlan. LivePlan is a simple business planning and financial forecasting tool that makes business numbers simple. When you use LivePlan, you can also export your financial documents and choose from 10 professionally designed styles that instantly transform your plain document into an impressive report. View an income statement example PDF, created with LivePlan. LivePlan was user-friendly, supportive and provided meaningful guidance all while remaining very flexible.